​"Along Your Street is a contemporary art exhibition at Byard Art featuring some exciting pieces by a wide range of painters, ceramicists and sculptors. The works on show are all on the theme of you and your street, so come and see if you recognise some local landmarks. Whether you are looking for something to remind you of a trip to the area, or you are a local and want a reminder of home at its very best, we have something to suit all tastes and budgets." 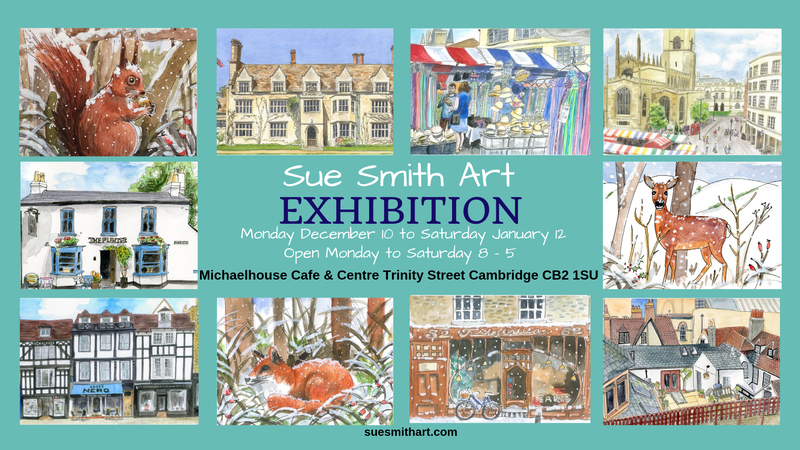 ​Please come to the Michaelhouse Cafe in Trinity Street, Cambridge on to see work by Cambridge artist Sue Smith. Sue will be sharing the space with two other talented artists, Ed Cearns and Gary Dadd. The exhibition for all three artists continues until January 12, 2019. As a member of Cambridge Urban Sketchers I will be exhibiting some of my sketches at Novi, in Regent Street, Cambridge, from 23 May to 24 June. Most of the sketches (including mine!) will be for sale. There will be a Private View from 6 pm to 9 pm on Tuesday 22 May, all welcome. On Saturday 16 June you will find me at Over Village Market along with other local artists and makers and more scrummy food! Join us on Over Village Green from 10.00 to 12.30 pm. I will be taking part in Cambridge Open Studios for the second year at my home at 1 Bell Hill, Histon CB24 9JQ. My studio will be open from 11 am to 6 pm each day. Please come and visit! On Saturday 22 September I will be at Longstanton Village Market along with other local artists and makers. There will be scrumptious food as well! You will find us on the Village Green in Nelson Crescent from 10.00 am to 12.30 pm.